How has becoming a mother changed you for the better: I have definitely become a more positive person. I have also learned to be in the moment instead of constantly thinking about my to-do list. How has becoming a mother changed you for the worst: I used to be punctual, but now I am late for everything...church, lunch dates, doctor's appointments, parties. It doesn't matter how early I start getting ready, as soon as I make for the door something happens to delay me like a poopie diaper, or spit up down the back of my blouse. Did you have an imaginary friend when you were a kid: I did! During one summer vacation in New York, I made up a friend. He was a penguin named Tuxedo. The funny thing was that I was surrounded by tons of other kids (my sister, cousins, neighbors), but only wanted to play with Tuxedo. We only hung out that summer, then he went back to the North Pole. Do your child(ren) have imaginary friends: Sometimes I catch Marlie in her crib smiling, cooing and gesturing at nothing. I like to think she's playing with her imaginary friend. If the FCC had a policy that every household could only have one TV station, which would you choose: This is a tough one because watching TV is my vice. I'd have to pick TBS because they air Family Guy, The Office and Seinfeld. All good shows eventually wind up in syndication on TBS. 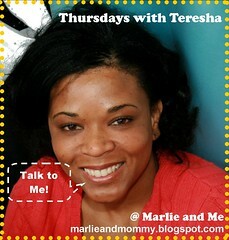 What station would your child(ren) pick: Marlie is too young to watch TV...thank goodness! Random question time. What is your favorite punctuation mark: ...I am a big fan of ellipses, which I use a lot...probably to the point of abuse, but at least I know what they are called. This time of year calls for hot drinks. Are you a hot cocoa or wassail fan: I love hot cocoa, but not the powdered stuff... give me real melted chocolate bars! Marlie is lactose intolerant, so this breastfeeding mama will be sticking to wassail this year. Any New Year's resolutions: I was never into making resolutions, but this year I have one... to relax. Check back next week for our next guest appearance...Lisa from Tales of a Soon-To-Be-Soccer Mom! I thought an ellipse was a stretched out circle. Is there another kind I don't know about? Ellipsis (plural ellipses; from the Greek: élleipsis, "omission") is a mark or series of marks that usually indicate an intentional omission of a word or a phrase from the original text. An ellipsis can also be used to indicate a pause in speech, an unfinished thought, or, at the end of a sentence, a trailing off into silence. An ellipse looks like a circle that has been squashed into an oval. "I used to be punctual, but now I am late for everything"
Alyssa doesn't wear diapers any more, but she forever ruined my punctuality! I constantly find use for quotations from The Color Purple in my daily life LOL. One of my fave movies too! How does ellipsis not mean 2 ellipses? Amazing. And now I know how to use (and spell) them. Anyhoo, what a fun idea. 3 of your top 5 movies are in my top 15 (if not higher). Very cool!